One of JAMS most admired neutrals, Hon. Malcolm M. Lucas (Ret. ), passed away on Wednesday, September 28, 2016. Justice Lucas joined JAMS in 1996. 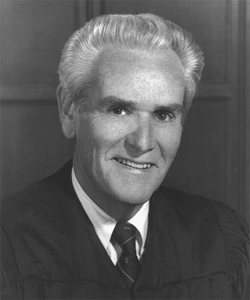 His distinguished legal career spanned more than four decades, from his Long Beach civil law practice to the Los Angeles Superior Court, federal court and, finally, to his service as 26th Chief Justice of California where he presided over one of the world’s largest judicial systems. During his tenure, the California Supreme Court issued landmark decisions on reapportionment, insurance law and employment law, among other issues. Widely heralded for bringing order and efficiency to the entire judicial system and restoring confidence in and respect for the Supreme Court, he was responsible for numerous administrative reforms in the high court’s internal operations that have improved procedures and streamlined the decision-making process. While on the JAMS panel, he successfully mediated and arbitrated numerous cases involving a wide variety of legal issues including complex multi-party disputes, business, insurance, intellectual property, employment and personal injury matters. Justice Lucas will be remembered for his dry sense of humor, his accessibility with clients and associates, his love of golf and above all his personable and sincere approach to all the great work he did. He is survived by wife Fiorenza, two children and six step-children. Everyone at JAMS, as well as his many friends and colleagues in the legal community, will greatly miss him. There will be a celebration of Justice Lucas’ life at a later date.